The scalable Montana map on this page shows the state's major roads and highways as well as its counties and cities, including Helena, Montana's capital city, and Billings, its most populous city. To display the map in full-screen mode, click or touch the full screen button. To zoom in on the Montana state road map, click or touch the plus (+) button; to zoom out, click or touch the minus (-) button. To scroll or pan the zoomed-in map, either (1) use the scroll bars or (2) simply swipe or drag the map in any direction. (The scrolling or panning method you use will depend on your device and browser capabilities.) At any time, you can display the entire Montana road map in a new window or print this page, including the visible portion of the map. Montana's Interstate Highways connect its major cities and facilitate travel between Montana and its neighbors. From its northern terminus at the Canadian border, Interstate Highway I-15 extends southward through Great Falls, Helena, and Butte before leaving Montana at its southern border with Idaho. From Montana's southeastern border with Wyoming, I-90 travelers can drive westward through Billings, Butte, and Missoula before leaving the State at its western border with Idaho. From its western terminus near Billings, I-94 travelers can drive eastward into North Dakota. Montana's auxiliary Interstate Highways serve the cities of Butte and Great Falls. I-115 provides easy access to Butte from I-15, while I-315 provides easy access to Great Falls from I-15. 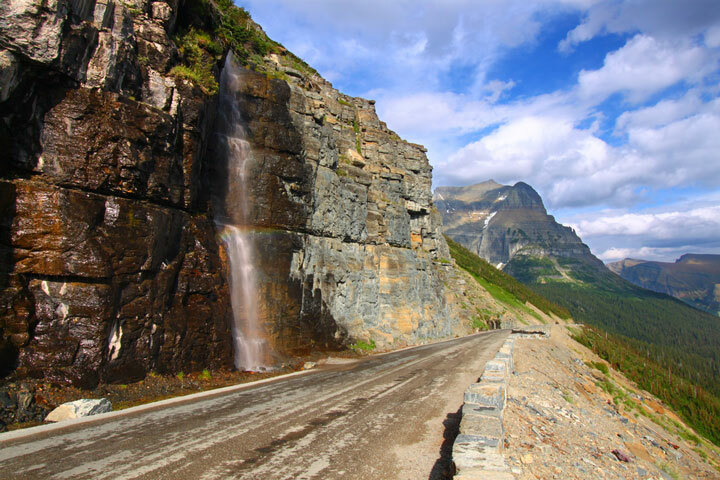 In northwestern Montana, Going-to-the-Sun Road winds through the breathtaking Glacier National Park. This 50-mile drive is open from June through mid-October, but gets overrun with snow drifts of up to 80 feet in winter and takes a full two months to clear. Traveling through the park, visitors will pass Lake McDonald on the left, and the Trail of the Cedars to the right. Birdwater Falls cascades spectacularly down the mountainside and Logan Pass takes drivers to an elevation of 6,646 feet where shaggy mountain goats roam. More information about scenic roads in Montana is available on this America's Byways: Montana web page. For more information about Montana's roads and transportation infrastructure, visit the Montana Department of Transportation website. For Montana road traffic conditions, visit the Federal Highway Administration's Montana Traffic Information page. Montana-Map.org is a State Maps reference source.